Round Traditional Sapphire and Round Diamond Cathedral Engagement Ring | Shane Co. Fit for royalty, this divine engagement ring not only displays a ravishing swirl design but is also accented by two round traditional blue sapphires (approx. 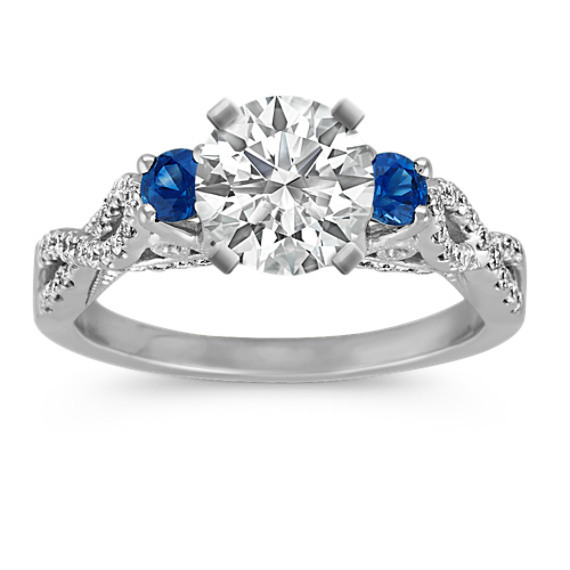 .26 carat TW) set on either side of the center diamond of your choice. An infinity swirl design dances across the base of the setting while 56 round diamonds (approx. .28 carat TW) bring a superior brilliance to the entire design. This engagement ring setting is crafted of quality 14 karat white gold and has a total gem weight of approximately .54 carat. I got to upgrade to this beautiful ring for my 10th anniversary this fall. The pictures don't do it justice, it is so stunning! I paired this with a simple band with alternating sapphires and diamonds (also from Shane of course) and it makes the most stunning combination!